Great article in BoatUS about securing your ropes, check it out. 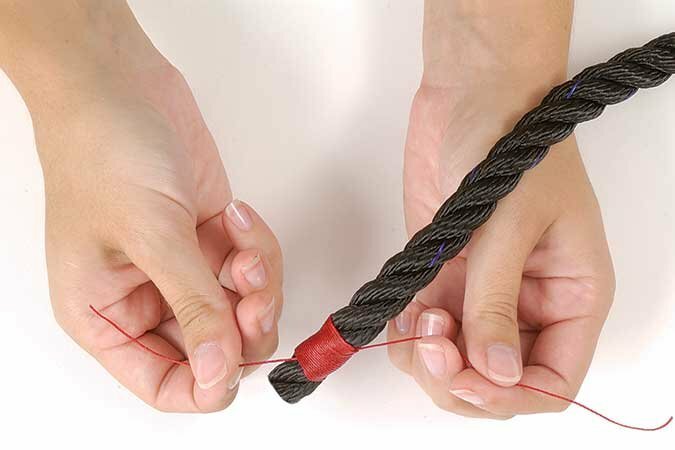 Want to show off your rope-work skills while preventing your lines from becoming unraveled? The common whipping does both. Well-executed whipping lends a neat and professional look to docklines. Sure, you can use plastic shrinkwrap or melt the ends to keep synthetic lines in check. But for a classier look, how about trying your hand at whipping? You don't need many tools, and there are different ways to do it, but it's a useful skill to master. Here's how. 1. Carefully melt the end of the line using a lighter to stop it from unraveling. Then the twine comes into play. 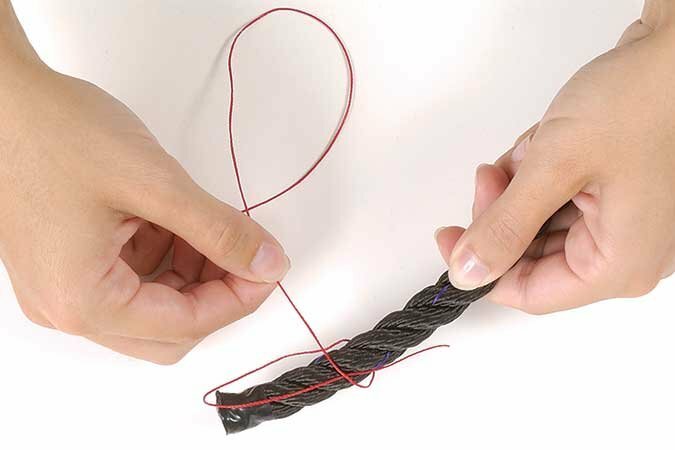 Starting from about a two-rope-diameter length from the end of the line, make a loop, or bight, in the whipping twine as shown. 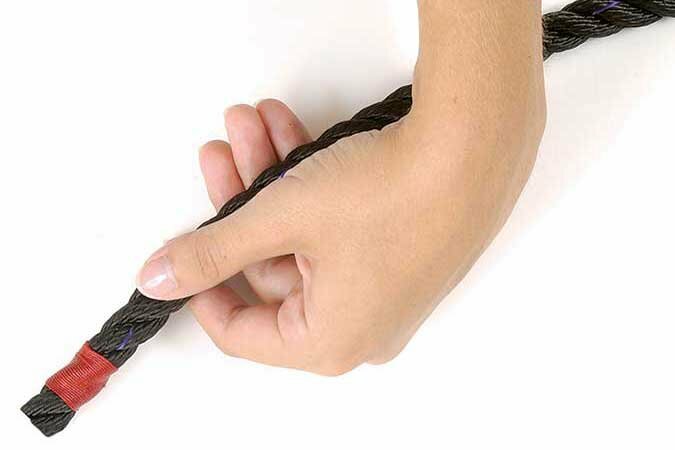 Leave about a 6-inch tail on the twine; you'll need this later when you finish off the whip. Unwind the twine from the spool as you go; don't cut it yet. 2. 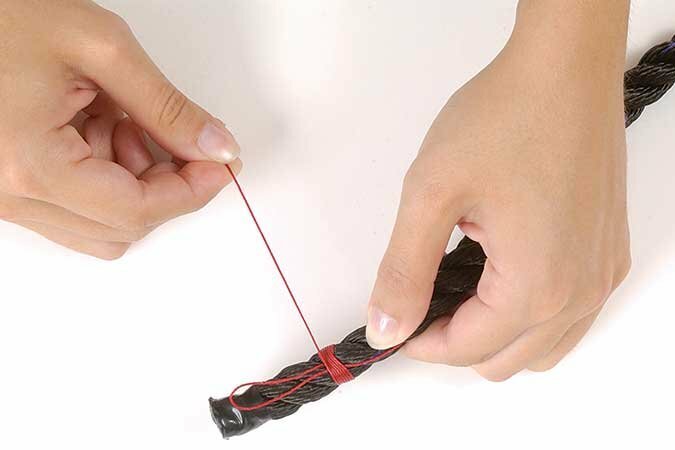 Grasp the line with one hand several inches from the end and place your thumb on the free end of the whipping twine so that neither line nor twine is able to move. 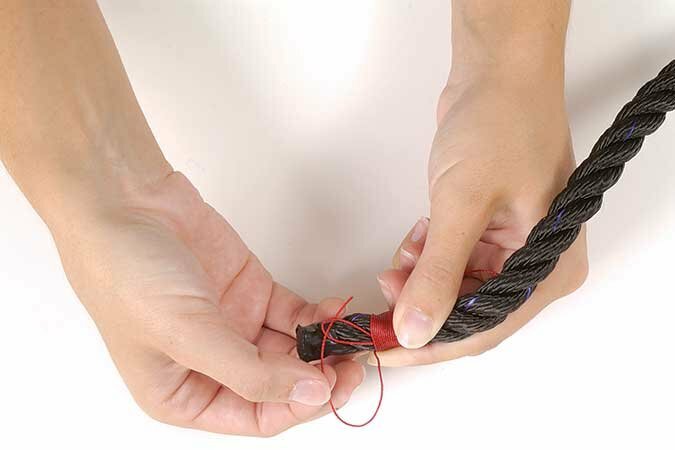 With your other hand,tightly wrap the twine neatly around the rope from your thumb toward the end of the rope. Make sure there are no gaps between each wrap. 3. Keep wrapping until you've covered approximately one-and-a-half times the diameter of the rope with the twine. Cut the twine, leaving about 3 inches, then pass this cut end through the loop you made in Step 1. TIP: The tighter the whipping, the better the finished result. Wear gloves if you feel the twine cuts into your fingers. 4. Keeping tension on the twine so it will not come unraveled, pull on the free end of the twine to bury the end under the wraps and secure the whipping. Do not pull it all the way through; aim for about midway. If you watch carefully, you should be able to see the loop move under the whipping as you tug the free end. 5. 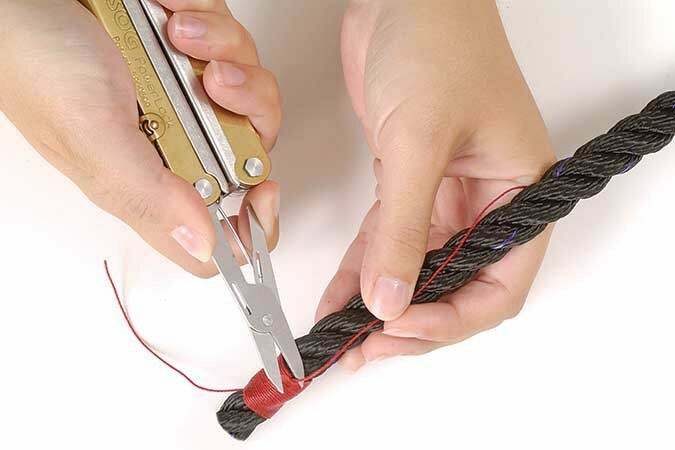 As a final step, use a sharp pair of scissors to trim both ends of the whipping twine. Boat owners are constantly changing hoses, at least, they should be checking them regularly. But you need to get make sure that you use the right hose for the job. Not all hoses are the same, AND NOT ALL HOSES ARE THE RIGHT SIZE FOR THE JOB..
Hoses are sized by their inside diameter (ID) and hose fittings are labeled based on the ID of the hoses. Hose should be well-supported and not allowed to sag. One of the best ways to inspect hoses is to squeeze them. If they feel mushy, crumbly, or excessively hard, they are beyond their useful life. Also, look at the ends—if they’re splitting or swollen, the rest of the hose is in just as bad shape even if you can’t see it. Hose that has standing liquid in it, whether effluent, gas, or water, won’t last as long, which is why it’s important to make hose runs that won’t trap liquid. Use the best marine grade 316 stainless steel hose clamps. Replace any that are even slightly rusted and double-clamp critical hoses. Clamps that are embossed rather that perforated are much stronger and longer-lasting. Stiff hoses can be easier to install if the end is dipped in boiling water; this allows the end to stretch easier. When shopping for hose, if it is not marked properly (A1, etc. ), it doesn’t meet the standards, no matter what the salesperson says. DO CELL PHONES PROVIDE ENOUGH PROTECTION AT SEA? You’re on your boat and you are in distress…. Cell phones are no substitute for modern GPS-equipped 406 EPIRBs or PLBs. They must be within range of a tower, often are not waterproof, and don't give a continuous signal that will be picked up by an RDF on a rescue vessel. However, if you have a signal, and the circumstances allow cell phone use, do it. A better alternative may be to use your properly connected, programmed, and registered VHF if in range, which will tell the Coast Guard who you are, and what boat you are on. Depending on the nature of your distress, the Coast Guard may have you shift communications to a cell phone, or activate your EPIRB or PLB, to assist in locating you and to be sure they don't lose contact if your cell phone or VHF dies or you lose the signal. Thanks to a proven track record of high reliability, EPIRBs remain a top choice for sending out an emergency signal to SAR personnel today. Since EPIRBs interface with Cospas-Sarsat international SAR (search and rescue) satellites that calculate your position via GPS, triangulation, or a combination of the two, they are essentially unlimited in range. EPIRBs are also equipped with a strobe light for quick visual acquisition, can be activated either manually or automatically, are required to float and be completely waterproof, and can be mounted with hydrostatic releases. "They have seen damage...caused by ethanol"
Interesting article that affects all boaters using fuel with ethanol. The reader survey results, which appear in the magazine’s July 2017 issue, report that 92 percent of survey respondents said “they have seen damage…caused by ethanol…and more business for the service department.” The most recent results are up from 87 percent from a similar survey last year. The July feature “Ethanol Still a Significant Challenge, Survey Says,” also reported that “more than 15 percent of readers said that based on what they are seeing in their business, more than half of the necessary repairs are being caused by ethanol-related issues.” Eighty-five percent of survey takers were “very concerned” about the use of E15 (fuel containing up to 15 percent ethanol). Signed into law in 2005, the Renewable Fuel Standard (RFS) requires an increasing amount of biofuels, such as corn ethanol, to be blended into the gasoline supply. When it was written, the RFS assumed that America’s use of gasoline would continue to grow. Since 2005, however, gasoline usage has actually declined, which today forces more ethanol into each gallon of gas. To keep up with the RFS mandate, in 2010 the EPA granted a waiver to allow E15 into the marketplace. However, only fuels containing up to 10 percent ethanol (E10) are permitted for use in recreational boats. What good is all the fancy electronics you spent a fortune on, if they don't work? Sometimes, as is often the case in many things in life, simple is the solution. Continuing on the previous blog, here's a continuation on tips for keeping your equipment functioning. Pull the plug! Just like your computer, when your GPS/chart plotter, fish finder, radar or other gear locks up or fails to respond to the controls, sometimes disconnecting the power cable or switching off the set’s circuit breaker and reapplying power can restore normal operation. In extreme cases, when all else fails, you can perform a “master reset.” Follow the instructions in the owner’s manual for the unit. Be advised that this is a last-resort procedure. A master reset can also delete all your waypoints, routes and custom settings. Quick tip: Regularly back up your waypoints and other entered data on a blank data card (refer to the unit’s owner’s manual for instructions on how to back up your waypoint list and other valuable data). Be sure you know the location of every fuse for every electronics instrument you have. And keep an adequate supply of each fuse size on board. Consider installing a second VHF radio and GPS/chart plotter. With a modest investment you can have independent redundancy for these essential instruments. Keep a handheld VHF and GPS as part of your electronics lineup. Basic models are very affordable, serve as portable second stations and stand ready to go with you if you ever have to leave your boat in an emergency. The bonus is that the radio and GPS are already connected internally, so the set’s DSC emergency button is ready for use as soon as you obtain, register and enter your personal Mobile Maritime Service Identity (MMSI) number These sets are waterproof and floatable and will operate even in the event you find yourself in the water. Always keep fresh batteries for every portable device you carry on board. And, if you don’t already have one, install a 12-volt cigarette lighter outlet to charge all of your handheld devices that have rechargeable batteries. With a little knowledge, you can easily apply marine caulk or sealant. Of course, if you aren't up to it, we can help. 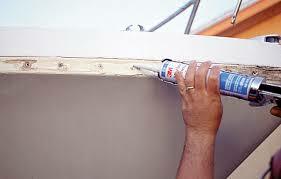 Sooner or later the need to apply caulk, sealant or adhesive arises in every boater’s life. Here are some tips for making the job go easier. Remove the existing bead of caulking with a reefing tool or reefing hook, either bought or made. I have used an old-fashioned can opener or a shop-made tool created by heating the shaft of an old screwdriver and then bending it at a right angle in a vice. Fein MultiMaster and Dremel also offer seam-reefing accessories. To ensure a good bond and seal, use a solvent to remove any residual skin of the old sealant. Lacquer thinner or mineral spirits work for most polysulfide and silicone sealants. Adhesive sealants may require specialty products: Check product labels. Wear protective gear when working with solvents and be mindful of fire hazards. Apply masking tape 1/8 inch to either side of the seam to be caulked. For rounded corners, “overmask” at a right angle, and then use a jar cap or other guide with a utility knife to carefully cut out the radius. Masking takes time, but using tape ensures easier cleanup. Too many DIY boaters cut off the caulking nozzle tip wrong. It’s important to examine the tip and cut it at the point that is just a wee bit narrower than the width you need. Also, cut the tip at about 45 degrees. The actual hole should be an oval, the narrow dimension of which is just narrower than the seam or bead. In most cases, a neater result can be achieved by pushing the caulking gun while applying the caulk. Press just hard enough so that the speed at which you are pushing doesn’t exceed the rate of caulk being delivered from the tip. Ideally, there should be a slight “hill” or “ball” of caulk just in front of the tip as you move it along. Practice on scrap if you haven’t done much caulking. The time to tool — that is: fix, neaten or modify — the bead of caulk you applied is the time it takes the caulk to begin to skin over and will vary by brand and type and environmental conditions. Swipe the bead with a gloved finger dipped in water to smooth the bead. Wipe fingers clean between swipes. Be sure to peel the masking tape before skin-over also. Caulking dries and cracks and should be renewed periodically around bilge and fuel tank hatches, ports, windows and the hull-to-deck joint. The trick is to get the cleaning and maintenance finished so you can maximize your time on the water. Eisenglass (clear flexible vinyl) should not be cleaned with an ammonia-based glass cleaner because the ammonia breaks it down and will dry it out. The best approach is to wash eisenglass with fresh water, add some Woolite for a second wash, then rinse. Dry the eisenglass with a soft cotton or microfiber cloth and apply 210 Plastic Cleaner or Plexus for long-lasting protection. Surface rust can be taken off metal and fiberglass with a paste made of water and baking soda (50-50). Rust that's more than skin deep, however, requires a potent cleaner containing oxalic acid. Find several to choose from at West Marine. Always remember to thoroughly rinse it away after the rust disappears because the acid can damage metals and fiberglass if left on too long. Use Rain-X on your boat's exterior glass. Once Rain-X is applied, the glass doesn't attract or retain hard water spots as easily, and unless in a downpour you don't need to run the wipers because the water simply slips off the glass. Dissolve two tablespoons of cream of tartar in one quart of hot water, and use it as a polish with a soft cloth. If you want a clean windshield when you arrive at the boat ramp after a long haul down the road, simply cover your windshield with a strip of plastic wrap before leaving home. Secure it well. When you arrive at the boat launch, peel the plastic wrap off and unavoidable bug splatters and road grime will peel away with it. Use equal parts baking soda and powdered sugar. The sugar attracts them and the baking soda kills them. Editors' Note: Cockroach hotels are another option. Save major cleaning jobs for when the boat is out of the water. When using cleaning products keep them near the center of the boat to reduce the chance of an overboard spill, and when performing bigger jobs on land, try to conduct the work as far from the water's edge as possible. Every time you wash your boat with a soft deck brush, use the same brush and soap on the boat cover or other canvas, which will keep canvas clean for a long time. When acrylic windscreens and opening ports become foggy looking from countless tiny scratches, buff them out with regular toothpaste (not gel). It has just the right amount of abrasives to buff out those scratches without making a bunch of new ones. All it takes is time, elbow grease, and lots of circular motion with a cotton rag. Try out on a small spot first. Magic Eraser, a Procter & Gamble Mr. Clean product, is a great tool to have on the boat. It gets rid of stubborn stains, skid marks, and streaks on just about any surface. I use a Magic Eraser pad for nonskid deck areas. You'll need to rinse your work area as you go; if it remains in contact with an area for an extended time, its "magic" will remove a waxed finish. CAN I LIVE ABOARD MY BOAT? Can I live aboard a boat? What is the first thing I should do if I want to live aboard? It might seem a bit backward, but once you have a general idea what kind of boat you’d like to call home, it is usually better to research your marina options. In some markets, there are no available slips for liveaboards and in others space is not an issue. There are too many people that end up with boats and no place to put them. Some people will even pay for a slip when it becomes available while they continue to locate and buy their boat. The second thing you should do, after you know where you can put your boat along with any possible limitations (such as boat size) is choose your boat and clearly develop an understanding of the costs. Can I still have my Internet access, Cable/Sat. TV, DVD, Stereo and computer? Sure. Wired amentities such as cable and landline telephone depend on your marina. If cable companies provide service to the docks, you can receive a plethora of cable/HDTV channels, high speed internet and possibly even telephone. However, everything can also be wireless these days, and many marinas even offer wireless high speed internet (some even offer this for free). Cell phones are a popular replacement. A cell phone with a data plan can act as a modem providing you with mobile wireless internet service. TV can be received via antenna or satellite dish, mounted on the dock or deck (dock mounting requires the marina’s consent). With AC power, everything that requires power can be brought aboard. A few cautionary notes however. A boat is limited space. Smaller/fewer pieces of gear are better. Try not to bring aboard gear that can’t be stowed properly and safely. Boats move and things fall over. Use CD/DVD storage books and get rid of or store the cases. Consider car stereos over rack stereos and boom boxes for space and durability. I have a flat computer screen (and a laptop) that doubles as a TV, but some liveaboards are using car DVD players very effectively (even for tv with a separate tv tuner). In my boat, everything (including TV/audio/computer) runs on 12 volts off of compact pieces of equipment. Finally, when we talk about storing electronic gear, remember the lessons of condensation and moisture. If the area you store your gear can drop below the dew point, that location will get moist and can easily destroy your toys. It’s not the surface of the equipment that you need to worry about, but what is happening on the inside. Heat those areas or store elsewhere.